Dies in brass / bronze alloy for the production of the pasta type depending on the format chosen for Fimar MPF 1,5N. The price is for one die. Bronze dies for pasta production depending on the chosen format for Fimar PF40E. The price is for one die. Dies in brass / bronze alloy for the production of the pasta type depending on the format chosen for Fimar MPF 4N. The price is for one die. Dies in brass / bronze alloy for the production of the pasta type depending on the format chosen for Fimar MPF 2,5N. The price is for one die. Dies in bronze for the production of the pasta type depending on the format chosen for Lillodue - Bottene. The price is for one die. Dies in brass / bronze alloy for the production of the pasta type depending on the format chosen for Fimar MPF 8N. The price is for one die. Dies in bronze for the production of the pasta type depending on the format chosen for Chef in Casa - Imperia. The price is for one die. Dies in bronze for the production of the pasta type depending on the format chosen for Inver 3 - Bottene. The price is for one die. Moulds in bronze for the production of the pasta type depending on the format chosen for Dolly - La Monferrina. Dies in bronze for the production of the pasta type depending on the format chosen for PM 80 - Bottene. Il prezzo si intende per una trafila. Dies in bronze for the production of the pasta type depending on the format chosen for Inver 7 - Bottene. The price is for one die. Dies in bronze for the production of the pasta type depending on the format chosen for Restaurant Electronic - Imperia. The price is for one die. Dies in bronze for the production of the pasta type depending on the format chosen for Restaurant Electric - Imperia. The price is for one die. Dies in bronze for the production of the pasta type depending on the format chosen for Restaurant Manual - Imperia. The price is for one die. Dies in bronze for the production of the pasta type depending on the format chosen for P3 - La Monferrina. The price is for one die. Dies in bronze for the production of the pasta type depending on the format chosen for PM 96 - Bottene. The price is for one die. Dies in bronze for the production of the pasta type depending on the format chosen for P12 - La Monferrina. The price is for one die. Dies in bronze for the production of the pasta type depending on the format chosen for P6 - La Monferrina. The price is for one die. Dies in bronze for the production of the pasta type depending on the format chosen for P50 - La Monferrina. The price is for one die. 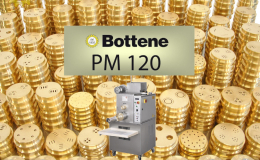 Dies in bronze for the production of the pasta type depending on the format chosen for PM 120 - Bottene. The price is for one die.